Okay, okay. I know it’s not Christmas. You probably know that, too. The thing is, I was thinking about romance topics to blog about, and I settled on first kisses. Since I’m writing a series, I decided that it made the most sense to share the first kiss from the first book in the series. We’re talking #firstkiss over at @inspyromance today! Here’s a little background: Rylie and Zach are dancing at a sort-of Christmas formal for the kids in the pediatric oncology unit. Zach’s niece is attending the dance via the internet. As this scene starts, she’s on a portable tablet being held by one of the nearby nurses. Zach continued to hold her close, his voice low enough that it wouldn’t carry beyond the circle of his arms. “I wasn’t entirely on speaking terms with God there for a little while, but as soon as I started talking to Him again, He reminded me that guilt isn’t mine to give. Making myself feel badly over good things happening in my life doesn’t do my niece any good.” He gave his trademark shrug then, and Rylie couldn’t help but revel in the sensation of his muscles flexing under her left hand. They were still on the dance floor, but their movements had slowed to more of a sway than anything else. They could have been the only ones out there for all the notice Rylie gave the other dancers. Rylie bit her bottom lip, fighting the urge to smile back at him. If you want to see what happens next – or how they got this far – you can get An Informal Christmas here – or you can enter the giveaway below. To enter the giveaway, comment below with your most memorable first kiss – either in real life, a book, or a movie. 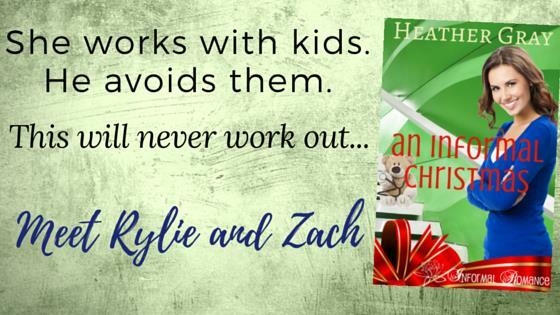 One winner will receive a complimentary e-book copy of An Informal Christmas. Comments are welcome anytime, but the giveaway will close at midnight on Friday night, June 3rd. The winner will be announced in the Sunday Edition right here on the blog on June 5th. I’m reading a Christmas novella now…they’re great anytime of the year. :) I enjoyed your excerpt, Heather…thanks for sharing. Love the meme! Your story sounds like so much fun….and the anticipation for that kiss, wow!! My first kiss with my boyfriend (now husband) was nothing short of magical. We went on a date and then sat in his car and talked and flirted then he leaned in for the kill! It was sooo amazing….I practically melted! I thought my heart was going to beat right out of my chest! He totally rocked my world! I loved how Zach hanged mistletoe everywhere in case there was any chance their kiss might get Rylie in trouble and the whole party started kissing. First kiss can either be magical or a blah. Mine was magical because I can still feel it as if it was yesterday ( it happened 23 yrs ago). Loved that book! :) Sweet story! Story sounds sweet. My first kiss was from my now husband…we were both a bit shy, but after that..wow! He still makes me melt. I am blessed to be married to my best friend. One of my favorite first kisses isn’t my own, but the one at the end of You’ve Got Mail. I love how sweet it was and how the dog reaches up to be petted during it. I enjoyed this novella Heather and look forward to reading more! I have yet to read this one, Heather, so would love to win it. :-) One of my favourite first kisses comes from the film Six Days and Seven Nights, starring Harrison Ford and Ann Heche. My first kiss with my hubby, I saw fireworks! Awesome!! That’s the sort of thing you’ll get to tell your kids, your grandkids, and anyone else who will listen for years to come!! I love Christmas stories year round. I’m guessing he kisses her right there in the middle of the dance floor, with no music and everyone watching. Oh, my first kiss was decidedly unmemorable. My favorite kids is the final kids in the movie Princess Bride.